Having a bit of fun playing around with the gorgeous templates from The Cutest Blog on the Block ... still the same blog, just a new look! Firstly, thank you everyone who wrote such lovely and thoughtful comments about Uncle Paul. He was a very special person, and I wish I'd had more time with him. Miss Petal gave us all a scare earlier this week - she got too friendly with a bee! Her poor little face got all swollen, and I rushed her to the vet for injections of anti-histamine and cortisone. On the advice of Petal's breeder, and many other chi owners, I now have Bendryl (with anti-histamine) in the cupboard for first aid. Her throat had the worst swelling, so I wonder whether she actually ate the ill-fated bee! The vet couldn't find any sign of the stinger. Around 11.30pm the injections must have worn off, as she then developed raised reddish welts on her legs and around her mouth. Thankfully they disappeared within an hour or two, but we had an unsettled night, checking her to make sure all was well. And it was - she's bright and active again, and hopefully has learnt her lesson about being friends with insects! 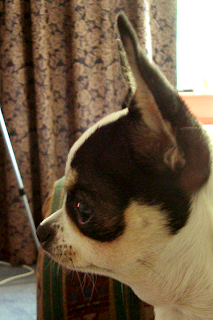 As Viv, her breeder, says, chihuahuas are 'treacle beaks', always sticking their noses into something! I am so glad Petal hasn't found another buzzy friend!! 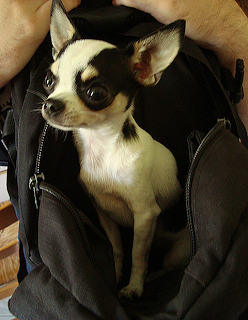 She is so cute in her backpack!! With all the viscious insects in OZ, I'm surprised the vet could narrow it down to a common bee. Poor baby. Glad she is better now. Nosey little girl! I love the new look...I'm glad that Ms.Petal is doing better. Poor Girl! Poor baby. But glad to hear that she is doing better. Just like a child curious and don't have a sense of danger. I also love your knitting work. Beautiful. I have taught myself to sew, knit, crochet, etc. I just love it. I feel like it is something I am good. Well not crocheting, my blanket tend to lopsided. Now tell Miss Petal to be careful bees aren't friendly. happy to know Petal is all better. it's funny how many people meds can be (carefully)used for animals. glad that benadryl is the drug of choice since it helps major allergic reactions with people. With her throat swollen, that was definitely major! I can commiserate with her, as I once had a wasp fly up when I was hanging laundry outdoors and sting me on the neck! When I reflexively swatted it away, then it stung me on one finger. Fortunately I have Benedryl in the house. That was the one time I used the gel and the oral at the same time, and fortunately it worked. Poor petal... I've always been thankful that ours have never caught a bee. But, we also have tons of Benadryl for one of the pups allergies, so good to know! Hope she's feeling better by tomorrow! Thank you for the blog link. I've wanted to spruce things up but didn't like the blogger options. Poor Miss Petal. I have a nasty bee alergy and carry an epi pen for just those emergencies. Yikes! Glad Petal is ok.